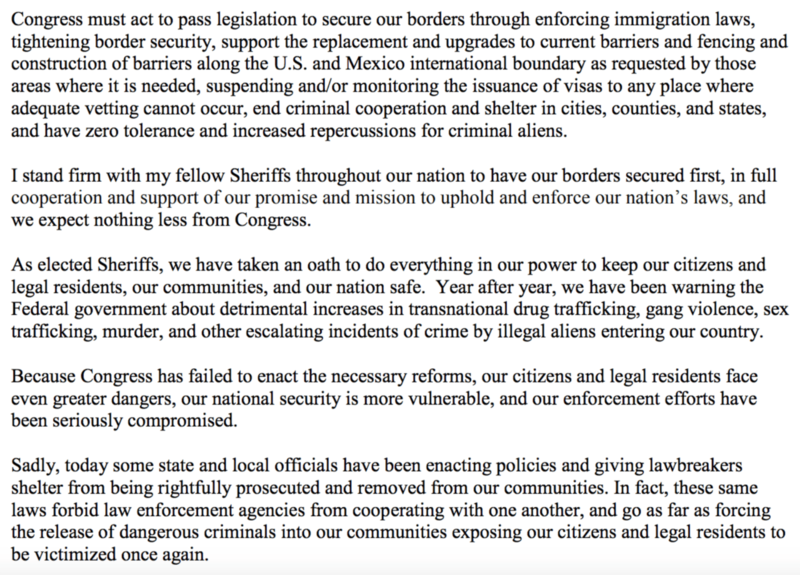 Nearly 400 sheriffs across the country are calling on the Republican-controlled Congress to follow through on President Trump’s popular immigration agenda by securing the nation’s porous borders and criminalizing sanctuary cities. Illegal immigration, resulting in 12 to 30 million illegal aliens now living in the U.S., has come at not only the expense of American citizens, but also local law enforcement agencies that do not have the resources or manpower to take on the issue. For pro-American immigration reformers, for months, the Goodlatte plan has been considered the best option for the Republicans in Congress to help Trump fulfill his immigration promises. Though the plan would allow a small group of illegal aliens to stay in the U.S., the amnesty would be offset with immediate reductions in legal immigration, whereas the country currently admits more than one million legal immigrants every year. Now that the country’s been overrun, some sheriffs notice a problem. A local constable here in north Texas, who is a retired state trooper, said there are 17 south of the border gangs operating in his jurisdiction. His church is now allowing weapons during services. He not only carries his service pistol while off duty, but a short barreled rifle in his car. When the cops are worried I’d say there was a real problem.